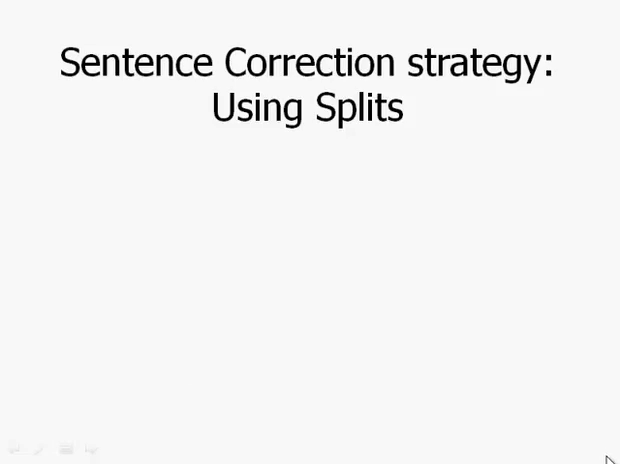 Now, we can begin talking about some general sentence correction strategies. Before I even begin this, let me just say that this module requires a bit of patience, in the sense that there are several general strategies we need to discuss before we can even get into the content of the questions. So believe it or not, after these first five videos, you will not be ready to actually dive into sentence correction yet. It actually takes a little while to build up and cover all the content. So first of all, we'll just cover these overall strategies, and the biggest strategy is something called Using Splits. And the easiest way to talk about this strategy is to first talk about the worst way to do the sentence correction. The worst possible way to do sentence correction would be, read the prompt carefully, and then very carefully read each of the five answer choices separately from beginning to end. That would be an absolute train wreck disaster way to go through sentence correction. It would take far too long to be spending five minutes on every question. Instead, use splits. But what do I mean by that? Consider this schematic, pretend all of this is text. We read our text, we read the prompt here, and we notice there a couple points of interest. Maybe these are grammatical mistakes, maybe they're not mistakes, we don't know. Then, when we look at the answer choices, first of all, we're not even gonna bother to look at A, because we know A is a complete repeat of what we read in the prompt already. We're gonna scan down the answer choices and just notice differences among the answer choices. So notice, A, B and C all have the same thing, and D and E have something else, at least in this opening portion. What we have here is what we can call a three versus two split. And in other words, if we can figure out which one of them is correct and which one of them is not correct, it would allow us to eliminate a group of answers together. So for example, suppose, just for the sake of argument, that the red were something that were a grammatical mistake. The red circle's a grammatical mistake, and the purple half circle is correct. Well, if that were true, that would allow us to eliminate all in one fell swoop A, B, and C. So right away, just scanning down the answers, right away we'd be down to two answer choices from five. Now that's incredibly efficient. The other split of course is among these. Notice that if we happen to eliminate A, B and C, we don't even have to deal with this orange thing. Maybe that orange thing is some point and we don't quite remember it. And it doesn't even matter, because if we eliminate A, B and C, then we don't even have to look at it. Sometimes, eliminating according to one split will get you off the hook. You won't even have to think about something that's involved in another split. That's one of the many advantages of splits. So notice that between D and E, we'd still have to decide between the blue triangle and the green. I guess it's a green pentagon here. We still have to decide between those. It's rare that one split would be enough to eliminate down to a single answer. But often, looking at two or three splits, you'd be able to make this, this decision. Now here, it's highly, it's very neat here. In other words, everything is exactly the same place lined up with each other, it will not always work out quite so pretty. The GMAT likes to flip around word order on things like this. But this gives the basic idea, you're not reading through individual answer choices, you're grouping them, and then figuring out what's right or wrong by groups. So overall, to sum this up, the first thing you should do always is read the prompt very carefully. Always read the prompt carefully. Note the meaning of the prompts. So it's not just about reading for grammar, you have to read for meaning, and also notice any particular problems. And as we've discussed in the opening video, these could be grammatical problems, they could be logical problems, they could be rhetorical problems. So a whole host of different issues that we'll talk about when we get to the content. So, we note problems. Next, instead of reading the answer choices, we're gonna scan the answer choices. Scan vertically looking for differences among the answer choices. And then we're gonna eliminate choices in groups based on problems they have in common. That, and this is a pattern that the GMAT often follows, that if they have a grammatical mistake in one answer choice, chances are very good that that same grammatical mistake appears somewhere in another answer choice. So if you can find the two or three answer choices that share that grammatical mistake, you can eliminate them together. Finally, when you have isolated one choice, it's always a good idea, this is, again, if you have time, it's always a good idea, once you have that final choice, plug it back into the sentence and read carefully the sentence with the choice that you think is the right answer. This is by far the most efficient approach to sentence correction.